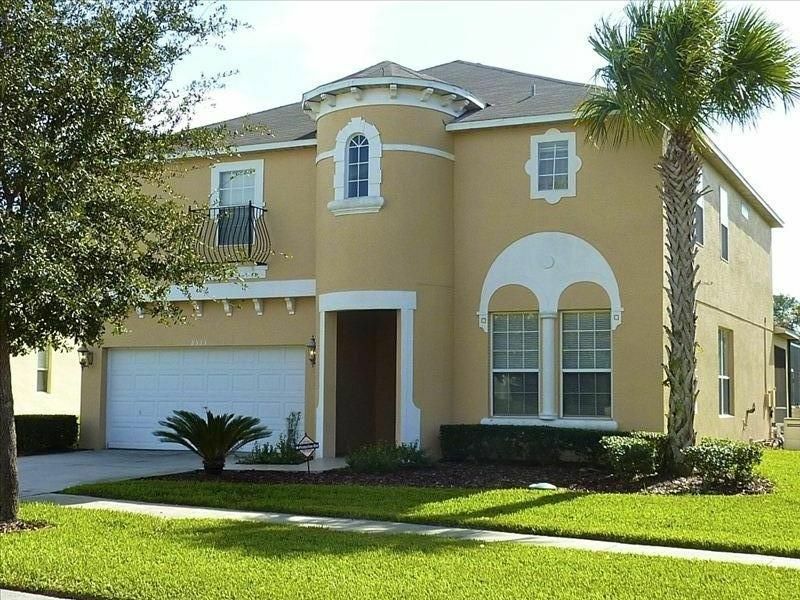 You will be in Emerald Island Resort which is one of the most desirable Resort Communities in the area and you will be less than 3 miles to Disney World. You can challenge the family to competing in the GAME ROOM which is outfitted with Pool Table, Air Hockey or foosball and TV/VCR/DVD and more games. This home is the ultimate in Vacationing but is only a part of what you get. The Resort itself has a heated pool and spa (not a free standing hot tub), Tiki Bar for relaxing and enjoying friends. There is a fitness room and Sauna. Gathering room for meetings, Cyber cafe with INTERNET ACCESS. Video game room. Concierge Service for tickets, dinner reservations and shows, Shuttle Service to the attractions, and a host of other treats for you. CHILDREN'S SLUMBER ROOM 6 single beds for the children of all ages with their own Tower Bathroom! with a smooth top stove, oven, refrigerator with ice and water on door, microwave, dishwasher, washing machine and dryer, iron and ironing board. * Some amenities and furnishings may change or become unavailable without notice. Shuttle Service to the attractions, and a host of other treats for you. Our family loves the beach, traveling, home-swapping, fishing, boating, camping, Disney and the attractions (of Course!) and BBQs. Our favorite holidays are Christmas and Halloween. fishing is permitted - just bring your poles! 2 dryers to keep up with all the guests! some amenities change without notice. Compare our Large gathering table . Seats 9- 12+ - there's room for everyone at this table! No more eating in shifts. sign out is required from office. Additional charge - electric heat pump $30 per day ($25 in warmer months). Solar covers are also provided. Additional charge - electric heat pump. Solar covers are also provided. Spa/hot tub is $20 per day ($15 in warmer months.) This is a spa not a free standing hot tub. Private Large Screened in South facing Pool and attached Spa (not a free standing hot tub), 9 Cable TVs, 9 VCRs, Dishes, Cookware, Linens & Towels provided, 'No Smoking' but Smoking allowed in the Patio Area. Some furnishings, game room and amenities change without notice, Some amenities may be come unavailable without notice. This is a very cute home with a great location! Very active homeowner and nice community. Thank you - I am glad you had a good time. Come again. 10/10 recommend. Enjoyed the time, House was neat and clean. Ms Lesley was very accommodating with a tricky situation we encountered. Will be back for sure!! Very nice group, I am glad you all had a great time. I hope you come again. Beautiful property, well maintained, and property manager is awesome! We had a wonderful time in this beautiful home. It was well maintained, very clean, and had plenty of room for our extended family of 14. The Disney character room and connecting "Rapunzel tower style" decorated bathroom for the kids was a great space. We spent a lot of time in the game room playing ping pong and enjoying the outdoor space and pool. Visiting the Disney parks is a breeze as it was only a 5-10 minute drive! Next time we all visit together we'll be sure to stay here again! Thank you so much for your hospitality. We really felt at home and comfortable in this gorgeous home. Thank you, I am glad you all had a great time. I appreciate the care you showed our home. I hope you come and stay again. Lovely home that is spacious, well kept and super clean. The owner, Leslie, is definitely one of the nicest people you will ever work with on VRBO. We had a horrible experience with our 1st rental (in that they appeared to be a complete scam) and Leslie worked with VRBO and was able to acccommodate our large family of 6 the next day early morning. She was so wonderful work with and was very empathetic to what had happened. Will also say that VRBO did a fantastic job of rectifying the issue with the first buyer as well. Renters beware of property owners that advertise multi locations with limited reviews in the Story Lake area!!! It’s a scam! Property was nicely maintained. It's probably about 10-15 yr old home but nicely kept up. The property manager was very helpful. I was able to ask for an early check in as we had an early flight with 2 young ones. She was able to accommodate us and even checked in with me to see if anything else was needed. Would definitely recommend a stay for anyone!